Eighteenth century town, named for John Williams, judge, state legislator, congressman, who lived nearby. Old St. John's Church is here. Vance County, named for North Carolina Governor Zebulon B. Vance, was established in 1881 on lands from Granville, Franklin and Warren Counties. 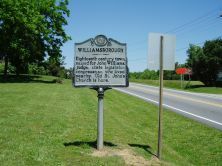 Although Henderson is the county seat, the first prominent town in the area was Williamsborough, incorporated in 1787. Named for Judge John Williams, who lived in the area, it flourished through the mid-nineteenth century. The principal point of interest in Williamsborough today is St. John’s Church, built in 1757, the oldest frame church in North Carolina. Williamsborough grew around the junction of the north-south and east-west stagecoach line crossings, quickly becoming a significant trade town. The town initially was called Lick, because it was a popular watering hole for animals, and then Nut Bush, after nearby Nut Bush Creek. Judge John Williams, for whom the town was named in 1779, was one of the first three North Carolina Supreme Court members and rendered judgment in the case of Bayard v. Singleton in 1787. He also served as a state legislator and as a national Congressman during the Continental Congress of 1778. 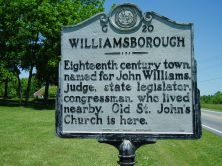 During the Revolutionary War, Williamsborough served as a temporary capital for North Carolina between the summer of 1781 and February of 1782, following the capture of Governor Thomas Burke in Hillsborough. It continued to grow and, after the war, was considered as a possible location for the new state capital and the new state university. Though chosen for neither, Williamsborough became a center for education, religion and business. The shift from coach travel to rail travel and the end of slavery led to the demise of Williamsborough in the mid-nineteenth century. The Raleigh and Gaston Railroad bypassed Williamsborough, instead passing eight miles south through present-day Henderson. This led to the rapid development of Henderson and decline of Williamsborough. The emancipation of slaves in North Carolina and the economic hardships of the Civil War and subsequent Reconstruction ruined the plantation-based agrarian economy of the area. Williamsborough never recovered from the changes. Today, the little of Williamsborough that still exists is highlighted by St. John’s Church, completed in 1773 and restored between 1947 and 1956 by the Friends of St John’s. John Ravenscroft, Bishop of the Episcopal Diocese, was rector at St. John’s from 1828 to 1830.